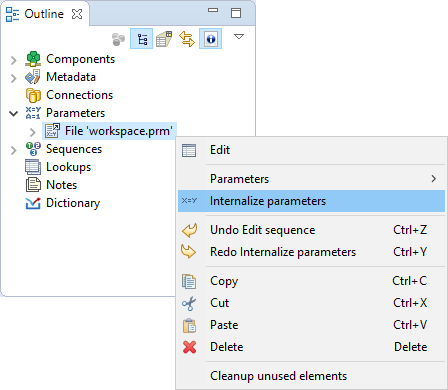 You can internalize any linked external (shared) parameter files into internal parameters. Right-clicking some of the external (shared) parameters items in the Outline pane and select Internalize parameters from the context menu. The linked external (shared) parameters disappear from the Outline pane. Parameters group and the newly created internal parameter items appear at the same location. The original external (shared) parameter files still remain in the project and can be seen in the Navigator pane (parameter files have the .prm extension).